Christine is a clinical social worker and has been counselling for the past 27 years. Christine works within a model that seeks to assist individuals to understand the issues that facilitate change, process past trauma, adjust to life events and develop new ways of coping. A graduate of Sydney University, Christine is also trained in Level 1 and 2 EMDR (Eye Movement Desensitization and Reprocessing). She is a registered member of EMDR Association of Australia and has been approved for Accredited EMDR Practitioner Status. She was trained and was supervised by Graham Taylor. 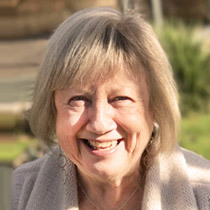 Christine is a TRTP Practitioner: The Richards Trauma Process and was trained by Judith Richards. Christine’s particular areas of interest are to support and assist clients to heal from the impact on their life of; grief, depression, anxiety, sexual abuse, domestic violence, PTSD from service in defence or from one-off traumatic events. A large percentage of her client case-load is working with those who suffer with the impact of Trauma, Complex Trauma, PTSD or Dissociation in their lives. Christine has facilitated workshops and groups covering such areas as: sexual abuse, domestic violence, stress management and healthy relationships. She has been involved in training programs and group presentations. She also offers supervision to other health professionals. She is a registered counsellor with Victims of Crime, Vietnam Veterans, Medicare, & WorkCover. She possesses a current Police check certificate and a Working with Children Certificate. Christine is a member of the AASW and is accredited. She is also an accredited Mental Health Worker. She works in Private Practice one day in Penrith and one day in the Hawkesbury. Christine operates in Penrith on Monday.